Not sold separately, choose one of our free Pocket Battle Games below plus get die-cut counters, with any purchase from TPS. Look for the offer and click the radio button for the game you want as you finish the checkout process. 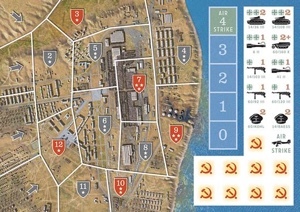 A solitaire game on the German attempts to clear the Dzerzhinsky Tractor Factory of Soviet defenders during the 1942 attack on Stalingrad. Much of the city had fallen to the Germans but the Soviets continued to resist due to their ability to hold the eastern bank of the river along the edge of the city. The Soviets turned many key areas into fortress blocks and one of these was the tractor factory. The ruins of the city restricted German movement and aided the Soviet defenders...many of whom maneuvered through sewers and other underground passages, hence the name "Rattenkrieg" (the Rat's War). Ironically, in January 1943, the Germans, who had become trapped inside Stalingrad, formed a northern pocket of resistance centered on the selfsame tractor factory. 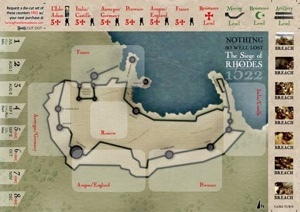 This game is set during the 1522 Ottoman siege of the fortress of Rhodes. Suleiman the Magnificent leads an Ottoman force numbering some 200,000 against 7,500 Hospitaller Knights and soldiers from all across Europe. The initial Ottoman assaults and artillery barrages were countered by the defenders who held sections of the walls by European nationality. Eventually, the Ottomans shifted to mining operations. The troops inside started countermining against these subsurface attacks. The Ottomans finally succeeded in breaching the fortress and with that, the Hospitallers and civilians were provided generous surrender terms. A Spanish minister reported the end to Emperor Charles V remarking, "Sire, nothing was so well lost...". Imperial Germany's one chance to avoid a battle of attrition and win WW1 at the outset revolved around a frighteningly simple, and yet complex plan. 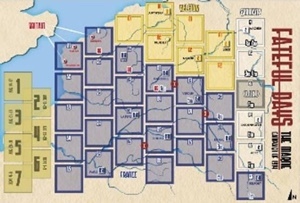 The simple part was the overall scheme to outflank the French armies from the very start, moving through Belgium to avoid the main French armies and forts. The complex bit was trying to get the German troops marching faster than the French rail network could redeploy their forces to meet them. Particularly as moving through Belgium triggered British intervention with a small but professional force that would come close, but not quite allow itself to be overrun. Here truly were the most Fateful Days for Europe since the Waterloo campaign. Find out how close both sides came to success (and failure) with this great Pocket Battle Game from TPS! 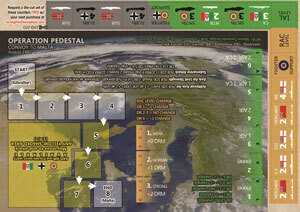 By August 1942, the fate of Malta, the key to stopping all Axis supplies to Africa, lay in a small relief convoy hastily assembled at Gibraltar. Sailing east over an increasingly hostile Mediterranean Sea dominated by Axis air, surface, and submarine forces, the convoy barely made it. Try your hand at recreating (or stopping) this heroic voyage.